Artist's illustration of NASA's Juno probe at Jupiter. The spacecraft is scheduled to slide into orbit around the giant planet on July 4, 2016. NASA's Juno spacecraft has arrived at Jupiter. Jupiter Moons' Orbital Dance - Humans Have Never Seen This! Juno Spacecraft Captures 1st Photo from Jupiter Orbit: NASA's Juno probe has snapped its first image of Jupiter since going into orbit around the giant planet last week. Wakey Wakey! Juno Spacecraft Turns on Science Gear at Jupiter: Juno powered up five of its nine science instruments Wednesday (July 6), two days after entering Jupiter orbit, and plans to turn on the other four before the end of the month, NASA officials said. Jupiter Probe Captures First-Ever View of Moons Moving (Video): In the weeks leading up to its arrival at Jupiter Monday night (July 4), Juno captured a stunning video of the four Galilean moons — Callisto, Europa, Ganymede and Io — circling the giant planet in a first-of-its-kind view of celestial dynamics. Google Doodle Celebrates Juno's Jupiter Arrival: Just minutes after Juno entered orbit around Jupiter late Monday night (July 4), Google's search page began showcasing a "doodle" celebrating the accomplishment. NASA, Juno Team Exult in Successful Jupiter Arrival: The people behind NASA's Juno mission rode a wave of emotions Monday night (July 4) as the spacecraft approached Jupiter and then, after a picture-perfect, 35-minute engine burn, became just the second probe ever to enter orbit around the giant planet. By Jove! NASA Probe Arrives at Jupiter After 5-Year Trek: NASA's robotic Juno probe began circling the solar system's largest planet tonight (July 4), ending a nearly five-year journey through deep space and becoming the first spacecraft to enter Jupiter orbit since NASA's Galileo mission did so in 1995. One Last View of Jupiter: Juno Snaps Photo Ahead of Tonight's Orbit Insertion: On June 29, NASA's Juno probe snapped one last picture of the Jupiter system before switching off its instruments in preparation for today's (July 4) daring dive through the planet's hellish radiation field. Juno Probe's Jupiter Arrival Tonight Fraught With Peril: The stakes and the risks are high for the Juno spacecraft's long-awaited arrival at Jupiter tonight (July 4). Fastest-Ever Spacecraft to Arrive at Jupiter Tonight: The Juno probe will be traveling faster than any other man-made object in history, as it arrives at Jupiter and enters into orbit around the giant planet. Lego Minifigures on NASA's Juno Jupiter Probe Inspire Design Challenge: Three Lego minifigures are flying aboard the Juno spaceprobe. The tiny stowaways are part of a mission to inspire young people to reach for the stars. Juno Spacecraft's July 4 Jupiter Arrival: What to Expect: A detailed timeline of events scheduled to take place on July 4, when Juno will arrive at the Jupiter system and decellerate and enter into orbit around the giant planet. Juno Probe Will Run Hellish Radiation Gauntlet at Jupiter Monday: If all goes according to plan Monday night (July 4), NASA's Juno probe will slip into orbit around Jupiter and get its first taste of the solar system's most intense radiation environment. Juno's Jupiter Arrival Continues String of July 4 Spaceflight Milestones: The Juno spacecraft's scheduled July 4 arrival in Jupiter orbit is just the latest in a series of spaceflight milestones to occur on the United States' birthday. Songs to Orbit Jupiter By: NASA, Apple Link Musicians to Juno Mission: When NASA's Juno probe enters polar orbit around Jupiter, scientists are hoping that its arrival will result in a better understanding of how the giant planet formed. They also hope it will inspire some really great music. Juno Probe Now on Autopilot Ahead of July 4 Jupiter Arrival: On Thursday afternoon (June 30), Juno's handlers sent a command designed to transition the probe into autopilot mode. Juno Spacecraft Enters Jupiter's Realm: The Juno probe, which is scheduled to begin orbiting Jupiter on Monday (July 4), has now entered Jupiter's sphere of influence. Juno Probe Snaps Photo of Jupiter and Its 4 Biggest Moons: Juno captured an image of Jupiter and its four biggest moons last week, as the spacecraft closed in on the giant planet. Jupiter's Auroras Create a Rhapsody in Blue Before Juno's July 4 Arrival (Time-Lapse Video): Bright blue auroras at Jupiter's north and south poles are putting on a veritable firework show just before the July 4 arrival of the Juno probe. How Do Planets Form? Juno's Jupiter Mission Aims to Find Out: Juno is scheduled to enter orbit around Jupiter on Monday (July 4), after a nearly five-year trek through deep space. Juno will study Jupiter over the following year and a half, peering inside the giant to gain clues about how planets form and evolve. Closing in on Jupiter: 7 Fun Facts About Juno's Mission: The Juno probe is an impressive piece of machinery: It is the msot distant solar-powered spacecraft to ever leave Earth, and runs on about as much power as your laptop. Read more about this awesome little probe. Up Close and Personal with Jupiter: A History of 9 Space Probes: NASA's Juno space probe is set to arrive at Jupiter on July 4, becoming the ninth probe to study the gas giant up close. Here is a brief history of the space probes that have explored this Jovian giant. One-Week Countdown Begins for Juno Mission's Daring Arrival at Jupiter: NASA's Juno probe is only one week away from its arrival at Jupiter, where it will execute a daring maneuver in order to get closer to the giant planet than any spacecraft has ever done in history. 'Destination: Jupiter' Follows Journey of NASA's Juno Space Probe: A new documentary celebrating the 5-year, 1.74-billion-mile (2.8 billion kilometers) journey of NASA's Juno space probe, is available to stream online. The film also probes Juno's amazing science pursuits. Jupiter Orbital Insertion: Juno's Dive Into the Unknown: NASA's Juno mission will enter Jupiter orbit on July 4, but little is known of arguably the most dangerous region in the solar system. NASA's Juno Probe in Home Stretch of Journey to Jupiter: The Juno probe, which launched in August 2011 on a mission to investigate Jupiter's structure, composition and formation history, is scheduled to begin orbiting the gas giant on July 4. Jupiter's Gravity Embraces NASA's Juno Spacecraft: On May 27, NASA's Juno probe crossed a gravitational boundary between Jupiter and the sun, and the gas giant began pulling the spacecraft in ahead of a planned July 4 arrival. NASA Jupiter Probe Fine-Tunes Path to Giant Planet: NASA's Juno spacecraft performed an engine burn on Feb. 3, lining up Jupiter more squarely ahead of its arrival at the giant planet on July 4. NASA Jupiter Probe Sets Distance Record for Solar-Powered Spacecraft: On Jan. 13, NASA's Juno spacecraft zoomed past the previous record of 492 million miles (792 million kilometers) from the sun, which was held by the European Space Agency's comet-chasing Rosetta mission, NASA officials said. These Are the Space Missions to Watch in 2016: Here's a brief rundown of the biggest spaceflight milestones to keep an eye out for in 2016, from a NASA probe's arrival at Jupiter to the highly anticipated maiden flight of SpaceX's huge new rocket. NASA Spacecraft Less Than 1 Year from Jupiter: NASA's Juno probe is now less than one year away from its rendezvous with Jupiter. Juno, which launched in August 2011, is scheduled to slip into orbit around the gas giant on July 4, 2016. NASA Spacecraft Snaps Amazing Photo of Earth En Route to Jupiter: When NASA's Jupiter-bound Juno spacecraft zipped around Earth on Oct. 9, it peered back at our planet for a photo op. NASA Jupiter Probe Recovers from Earth Flyby Glitch: NASA's Juno probe exited a protective "safe mode" on Oct. 11 and is currently operating normally as it streaks toward a July 2016 rendezvous with the solar system's largest planet, mission officials said. NASA Jupiter Probe Still In 'Safe Mode' After Earth Flyby Glitch: NASA's Juno spacecraft went into safe mode on Oct. 9, shortly after making its closest approach to Earth in a speed-boosting flyby. The probe's handlers aren't sure what happened, but they suspect a minor glitch rather than a mission-threatening problem. NASA Jupiter Probe Suffers Glitch After Earth Flyby: NASA's Juno probe detected an anomalous condition and shut itself down this afternoon (Oct. 9) after slingshotting around Earth to gain momentum for the long trip to the solar system's largest planet. NASA Spacecraft Slingshots By Earth On Way to Jupiter, Snaps Photos: NASA’s Juno spacecraft came within 347 miles (558 kilometers) of Earth during its closest approach, which occurred at 3:21 p.m. EDT (1921 GMT) today (Oct. 9) over South Africa. 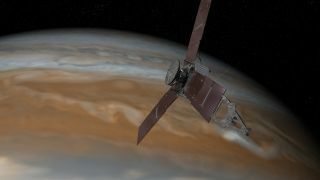 The maneuver boosts Juno’s speed for the long trip to Jupiter. Jupiter-Bound NASA Probe to Grab Speed Boost from Earth Flyby Wednesday: A NASA spacecraft bound for Jupiter will buzz Earth Wednesday (Oct. 9) to snag a gravity speed boost that will slingshot it toward the largest planet in the solar system. Jupiter-Bound NASA Spacecraft Will Swing By Earth Wednesday: NASA's 8,000-pound Juno probe will skim just 350 miles (560 kilometers) above Earth's surface on Oct. 9, getting a critical gravity assist more than two years after launching on a circuitous path to the solar system's largest planet. NASA's Juno Spacecraft Is Halfway to Jupiter: The odometer on NASA's Juno probe clicked over to 880 million miles (1.415 billion kilometers) on Monday (Aug. 12), space agency officials said. The spacecraft is thus halfway to Jupiter, at least in terms of distance traveled. Jupiter-Bound Probe's Maneuver in Deep Space Delayed: The second of two engine burns meant to put NASA's Jupiter-bound Juno probe on course for a speed-boosting Earth flyby next year has been pushed to Sept. 14, officials announced Tuesday (Sept. 4). Jupiter-Bound Probe Changes Orbit in Deep Space: NASA's Jupiter-bound Juno probe fired its main engine Thursday (Aug. 30) to help set up a speed-boosting flyby of Earth next year. NASA's Juno Mission to Probe Jupiter's Biggest Secrets: A NASA probe that is traveling through space on its way to Jupiter is expected to help astronomers unlock mysteries about the largest planet in our solar system when it arrives there in 2016. Far Out! Jupiter-Bound Probe Snaps Photo of Big Dipper: NASA's Juno spacecraft was beyond the orbit of Mars when it took a picture of the famed star pattern. Jupiter-Bound NASA Probe Adjusts Course Toward Giant Planet: A NASA probe on a five-year mission to Jupiter fired up its rocket thrusters this week to better aim itself at the largest planet in our solar system. Jupiter Probe Snaps Family Photo of Earth & Moon: A NASA probe headed to Jupiter has snapped a striking photo of Earth and the moon, showing our home planet as it appears from 6 million miles (10 million kilometers) away. After 'Phenomenal' Launch to Jupiter, Long Wait Begins, Scientists Say: The vast team of scientists and engineers responsible for launching NASA's new Juno spacecraft to Jupiter today (Aug. 5) can finally breathe a sigh of relief after a successful liftoff, but now comes the long, five-year wait for the probe to actually reach the gas giant. NASA Launches Spacecraft on Journey to Jupiter: NASA's Juno spacecraft blasted off Friday (Aug. 5), kicking off a five-year journey to faraway Jupiter, the largest planet in the solar system. NASA to Launch Juno Mission to Jupiter Today: NASA's Juno spacecraft is set to launch today (Aug. 5) on a mission to study the origin and evolution of the planet Jupiter, the solar system's largest planet. Target: Jupiter — Missions to the Solar System's Largest Planet: NASA's new Juno probe will be the ninth spacecraft to visit the solar system's largest planet. LEGO Figures Flying On NASA Jupiter Probe: They have launched aboard the space shuttle, visited the space station and flown to Mars. Now, three more "very special" LEGO figurines are set to fly to the planet Jupiter with NASA's Juno spacecraft. NASA's Juno Mission to Jupiter to Be Farthest Solar-Powered Trip: NASA's Juno spacecraft is heading for the planet Jupiter this week with a novel energy source for a deep space probe — solar power — making it the farthest robotic space traveler to run on sunlight, scientists say. NASA's Juno Probe Promises to Send Best Ever Photos of Jupiter: The Juno spacecraft will take closer and more detailed photos of Jupiter than ever before. NASA's New Juno Mission to Explore Jupiter's Mysteries: The mysteries regarding the origin of the king of the planets, Jupiter, could be solved by NASA's Juno mission, which is scheduled to launch toward the gas giant on Aug. 5. NASA's Juno Mission to Jupiter Poised for Friday Launch:A NASA spacecraft is just days away from blasting off on a five-year journey to Jupiter on a mission to find out what makes the largest planet in our solar system tick. NASA Set to Launch Spacecraft Toward Jupiter Next Week: NASA has attached its next spacecraft bound to explore Jupiter to the rocket that will launch the unmanned probe toward the gas giant next week. Space.com Gets an Inside Look at Jupiter-Bound Spacecraft: Space.com's Leonard David got an up-close look at Juno at the Colorado facilities of Lockheed Martin, which built the probe for NASA. NASA Begins Building New Spacecraft to Visit Jupiter: NASA has begun assembling its Juno spacecraft in preparation for a mission to Jupiter that will help scientists understand the origin and evolution of the giant planet. Juno Spacecraft to Study Jupiter: Eight years from now, NASA's Juno spacecraft will arrive at Jupiter to study the huge planet's magnetic and gravity fields and characterize its atmosphere, among other things. The Juno Mission to Jupiter: NASA has announced the selection of a new concept study for a Jupiter mission that will now move into a preliminary design phase. The mission is called Juno, and its goal is to perform a detailed study of the giant planet Jupiter.